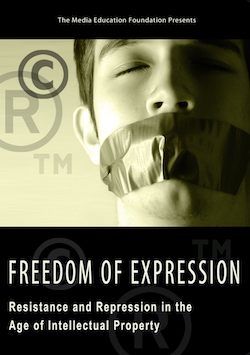 In 1998, university professor Kembrew McLeod (Associate Professor of Communication Studies at the University of Iowa) made headlines when he successfully trademarked the phrase "freedom of expression" to call attention to the extremes of intellectual property law. But in the years since, as fewer and fewer corporations have come to dominate the media landscape, copyright law has only become more restrictive. In this provocative film, McLeod continues his fight against the corporate chokehold on creative expression, translating the abstractions of copyright law into an engaging story about corporate power and the power of art. Freedom of Expression is an essential tool for educators, activists, filmmakers, students, artists, librarians, and more. DVD Extras including the short film "A Fair(y) Use Tale"
"We have a right to analyze, comment, critique, and even parody our own culture, but we must use existing works in order to do so effectively. This film stands for and justifies the use of preexisting works for legitimate purposes; the filmmakers are certainly in favor of copyright but not the corporate excesses that exist today. Freedom of Expression is well made and would be an excellent addition to any collection containing legal and public policy films..."
"This smartly-made and seriously funny documentary provides an aerial view of the battleground that is today's copyright landscape. Illustrating the comments of many well-known critics of runaway copyright & trademark law with apt audiovisual examples, Freedom of Expression succeeds as an engaging and concrete presentation." "It's about time someone made this movie. 700 Americans get sued into penury every month by the record industry. 70 million Americans file-share. Every generation of technology contains more locks to turn our computers into our masters, not our servants. Worst of all: no one seems to even notice as our tools for free speech are being turned into perfect snitches." "Citing legal cases and giving examples of people and companies which have been held liable for copyright infringement, Freedom of Expression is a must for anyone teaching a media study, library science or copyright law. The video should spur on classroom discussions and get students to think about what they see and experience everyday. It is a great resource for video collections in all schools and libraries. Highly Recommended." "This film is another fine way of bringing media studies' best thinkers onto your campus."